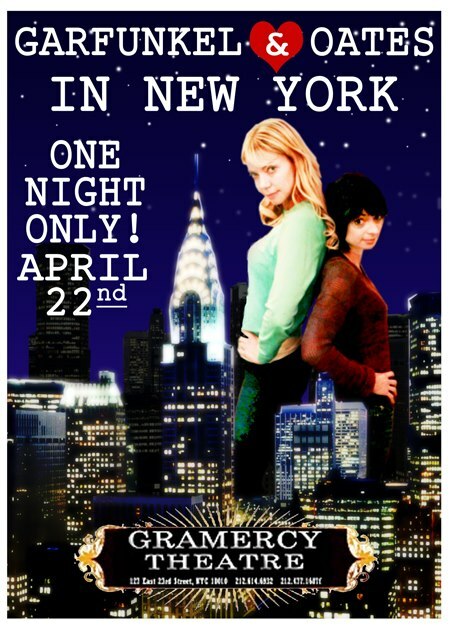 I am very excited that the multi-talented Garfunkel & Oates are coming to the Gramercy Theatre on April 22 (Buy Tickets). Garfunkel & Oates are a unique musical comedy duo comprised of actresses Kate Micucci (Raising Hope, Bored to Death) and Riki Lindhome (Enlightened, Fun Size, Last House on The Left). They’ve been featured in Variety’s 10 Comics to Watch and their very own HALF HOUR Special just premiered on Comedy Central. They’ve appeared on The Independent Spirit Awards, The Tonight Show with Jay Leno, Attack of the Show, Last Call with Carson Daily and their videos have been featured on CollegeHumor.com and FunnyorDie.com. Their album All Over Your Face was #1 on itunes comedy the week it was released and their NEW album Slippery When Moist was just released! If you’d like a chance to win a pair of free tickets to Garfunkel & Oates at the Gramercy Theatre, then please fill out the contest entry form after the jump. Contest ends on Monday, April 15 at midnight ET. One entry per person, US residents only. Video for “The College Try” and contest entry form after the jump.